Can you please provide more information on the subject of smoking while receiving chemotherapy and radiation treatment for breast cancer? What is the effect of continued smoking while receiving treatment, due to cigarette smoke containing over 4000 chemical compounds, hundreds of which are either poisonous or carcinogenic? When must a patient diagnosed with breast cancer stop smoking? First off, smoking is never a good thing. We always hope to prevent people from ever starting, let alone needing to quit. Although smoking is not associated with the diagnosis of breast cancer, there is ample evidence that patients who smoke do not tolerate chemotherapy and radiation therapy as well as nonsmokers. Fortunately, we know improvements in the bodies' ability to function begin within 24 hours of a patient quitting smoking. In some cancers (such as lung), studies have suggested that outcomes are better for those who quit smoking at diagnosis. People who quit smoking often feel that they have more energy almost immediately, which could certainly be a benefit when chemotherapy-induced fatigue sets in. Smoking can irritate mouth sores (a common side effect of chemotherapy) or affect the ability to taste, which can make eating even more difficult while on therapy - both good reasons to quit. When radiation is delivered for breast cancer, part of the lung receives radiation which can affect a small amount of its function. Those who smoke have less reserve then nonsmokers and this could potentially impact their overall lung function down the road. More importantly left sided breast irradiation does treat some of the heart and has been shown to increase the risk of coronary artery disease. Smoking greatly increases the risk of developing coronary artery disease and potentially puts the patient at even greater risk of heart problems down the road. 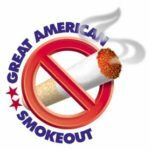 Quitting smoking is not easy, but fortunately there are options for assistance including medications and behavioral modification techniques. It is important for smokers to discuss this with their physicians so appropriate strategies can be developed to help them quit the habit and stay off the cancer sticks.